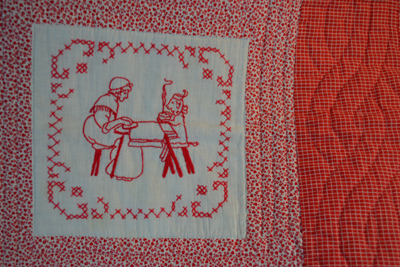 My Redwork hand-embroidered baby quilt done in the 1970's. 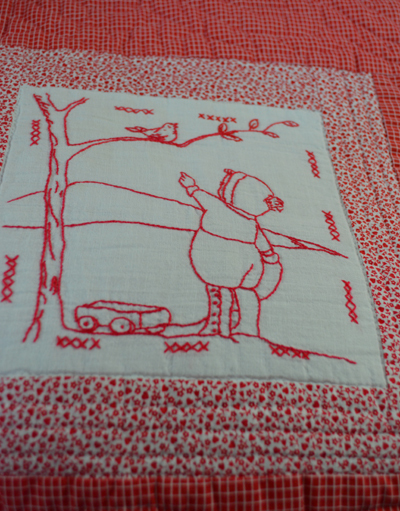 Last week one of my good friends wrote to me that she had found red and white embroidered quilt work and was in process of creating some of her own embroidery designs! Her interest was near to my heart, as I too love, what is known as Redwork. I wrote back to her that I featured Redwork information in my craft booth as when I started Little House, as one of my goals was to feature traditional needlework art forms and feature their histories. I was creating and selling Redwork, Bluework and other monochromatic embroidered quilt blocks done on my fancy sewing machine at the time. I had to be very careful in creating these blocks so as to not violate any copyright laws of these computer embroidery software companies. Of course I wasn't selling their patterns but only single block creations, but even those are marked on some software packages as for single person use only and not for reselling of wares. 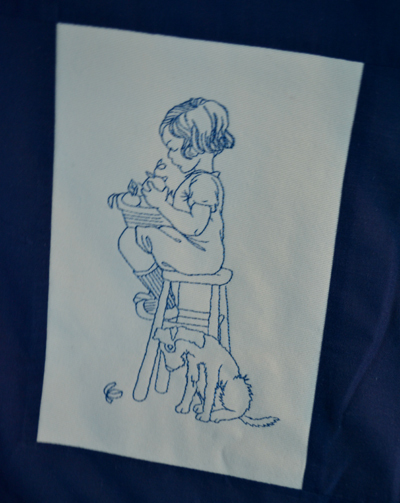 Before doing embroidery on my embroidery machine, I did such work by hand. 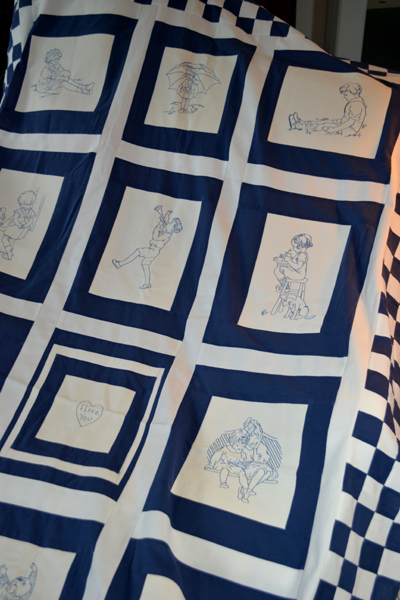 My friend has asked to see pictures of the Redwork baby quilt and the Bluework child's quilt top that I had written to her about. Meanwhile I mailed her the information that I handed out in my booth, before I deciding to share it with all of my readers. Machine embroidered quilt top (designs by Cactus Punch QLT04-redwork CD. 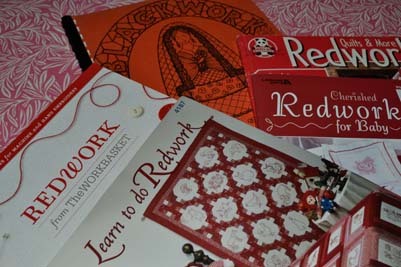 I compiled this information about Redwork about three years ago and credited all the e-resources used to gather this information, though some of them are no longer available and so I removed them from the resource list below. 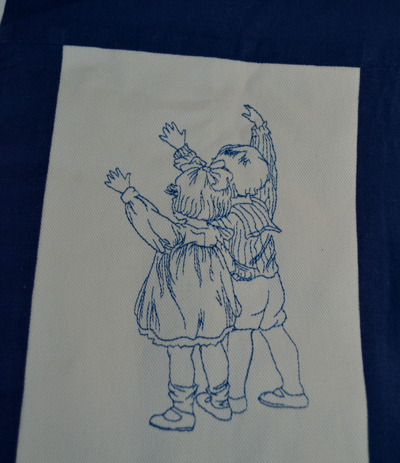 Some of you may be interested in reading more about this art form or locating old fashioned Redwork embroidery patterns and books so I have included a listing of those as well. It is a mere sampling and there are many more wonderful sites and tutorials on line. A special thanks to the reader who asked! Redwork is believed to have originated at the Royal School of Art Needlework in Kinsington, England in the early 1800's. In those days embroidery was part of a girl's education. The poor could use their sewing skills as paid work and the rich would use it to embellish their trousseaus. Redwork got its name from the Turkey Red cotton embroidery thread used for this simple outline-style embroidery design. Its name didn't just denote its color, but also the lengthy and complicated dying process that made this thread colorfast. It was an inexpensive machine-made thread whereas other embroidery threads of that day were expensive silk threads or non-colorfast threads that would "bleed" or run. 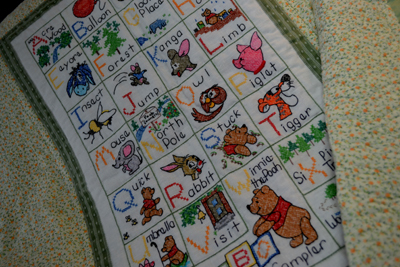 Silly and fun designs!by Aunt Martha's Iron Transfers. From 1860 through the 1920's this form of embroidery became very popular. 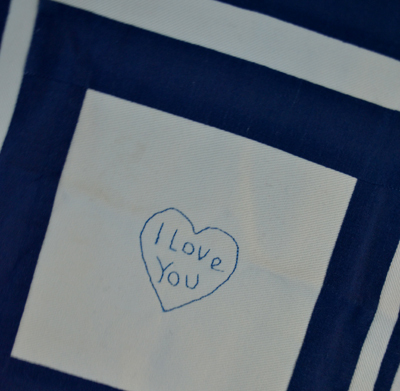 It was easy and simple, making it a popular way for young girls to learn and practice their embroidery skills. Sears Roebuck and other dry good catalogs stores of the day would sell "penny squares", which were simple preprinted designs on muslin squares that sold for a penny. For another penny, a skein of Turkey Red embroidery thread could be purchased and then these squares would be embroidered and sewn together without sashing or borders to make summer weight coverlets and spreads. 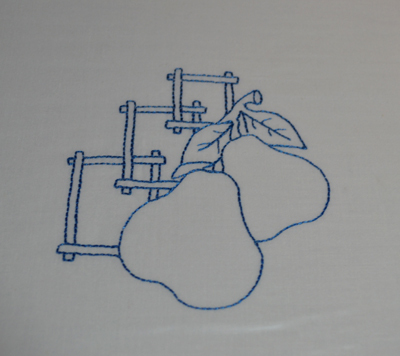 Once the squares were seamed together, the seams would be covered with a feather stitch. These summer weight spreads would simply be a "quilt top" hand-tied or tufted to a cotton backing without any batting or filling between the layers. Redwork became so popular that magazines would provide pull out Redwork patterns to promote selling their magazines. 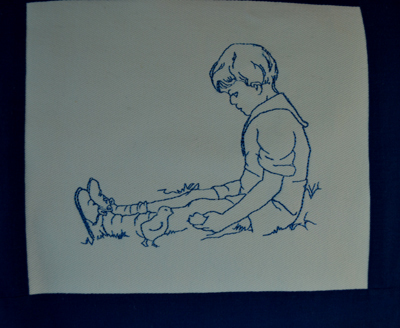 In 1870 iron-on transfers were developed and do-it-yourself pattern stamping kits were offered by catalog companies along with published patterns. For the love of this Redwork Cactus CD, I bought an embroidery machine! No color variations exist. The differences are due to my amateur photo skills. Bluework joined Redwork in popularity in the early 20th century as it was the next color to become colorfast (indigo blue). After 1930 synthetic dyes were manufactured in the U.S. and then a wide range of colorfast threads were available. Designs became multi-colored and the style of embroidery changed from this simple outline style to solid stitched designs. 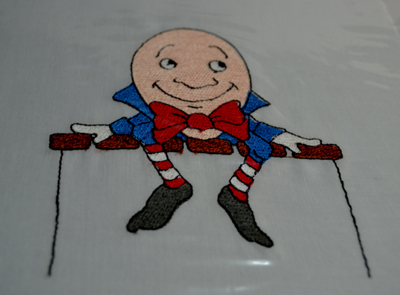 Humpty Dumpty is one of my favorites. This pattern was from a free e-site. Thank goodness for modern, inexpensive colorfast embroidery threads! A renewed interest in all types of handcrafts became popular again around the American Bicentennial in 1976. Quilters were inspired by the antique Redwork quilts and were largely responsible for making it a popular art form once again. 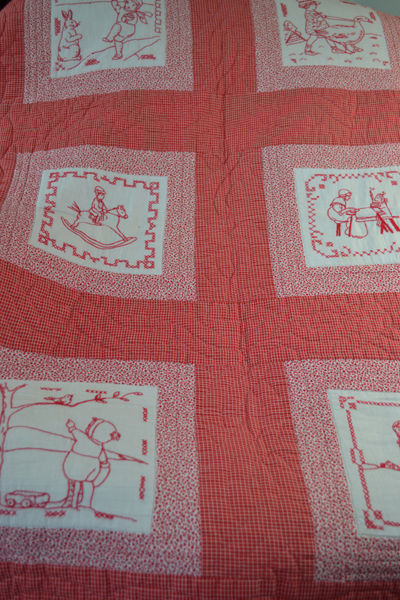 Antique Redwork quilts are occasionally found in antique stores today and such quilts are valued treasures. Redwork designs were simple, outline designs done with a basic outline stitch (AKA Kensington Stitch), and might include other simple stitches such as cross stitch, chain stitch, stem stitch, double running stitch, French knots, colonial knots, back stitch and split stitch. Eventually more fancy crazy quilt stitches were also added. Redwork customarily is done using two strands of six stranded embroidery floss or one strand if line detail is to be added. DMC #304 or #498 are considered by some to represent the most authentic "Turkey Red" color. Bluework, greenwork and blackwork also became popular. Some even do Redwork in purple. Generally Redwork is done in darker thread on light colored fabric (white, muslin, tea or coffee-dyed). 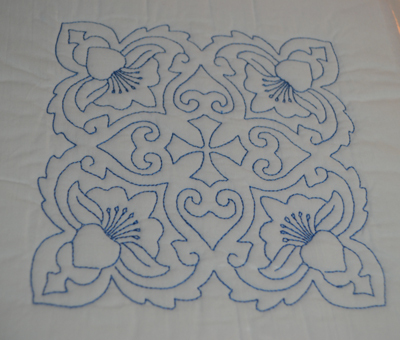 Now Redwork is the term used to designate the style of this basic embroidery instead of the color of the thread used. 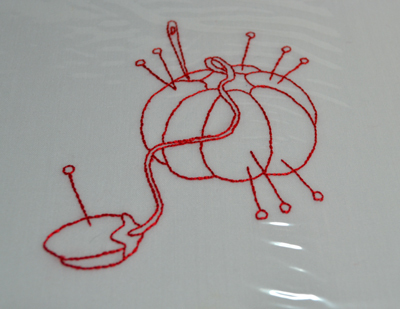 Other tools used in Redwork embroidery include an embroidery hoop to hold the material taut and embroidery needles that have bigger eyes, making them easier to thread. The use of the thimble was thought to be quite essential for a person who stitched, though skill is needed in its use and some prefer to stitch without one. 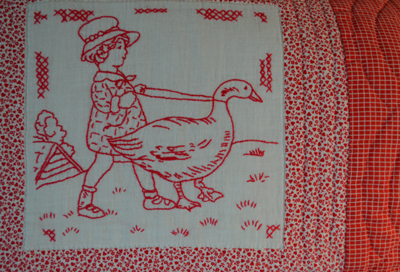 Common Redwork style embroidery designs include but are not exclusive to vintage sorts of flowers, fruits, vegetables, historical scenes and places, children, nursery rhymes, Sunbonnet Sue, days of the week, holiday designs and even Bible verses or moral sayings about the virtues of hard work. Simple designs can be hand-drawn or copied from coloring books and can be transferred by taping both the design and material onto a window and lightly tracing the design with a pencil. Sewing motifs are popular too. (excuse the glare from its cellophane package. Fruits and Vegetables are common Redwork designs. Recognize this simple heart from Raggedy Ann and Andy dolls? Traditionally, Redwork designs were added to common household items like dish towels, pillow cases and shams, coverlets and spreads, tablecloths, luncheon cloths, decorative pillows, laundry bags, dresser scarves, antimacassars, splashes,(cloths behind a washbowl), mantel covers, quilts, aprons, appliance covers, sachet pillows and handkerchiefs. Again this design is from the Cactus Punch QLT 4 Redwork CD. So sweet! Blackwork by The Bee Designs, 1975. Labels: Embroidery, Redwork, The History of Redwork. My Boomerang Daughter is Boomeranging Out!